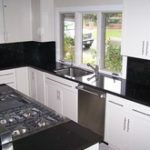 American Stone Edge is a full-service kitchen countertop installation company. We install countertops complete with optional stone or tile backsplashes. 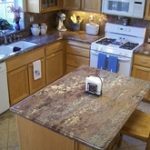 Depending on the nature of your installation, the process begins after you approve a quote and come with us to pick out a slab from one of our vendors. When we cut your slab to the dimensions of your countertop, we try to save extra pieces if we can. An extra piece can be installed in a tasteful, convenient area of your home like a cutting board or end table. When we cut your slab we are mindful of the fact that edges of adjoining stone will have to be book matched so that the grain and direction flow as seamlessly as possible. You can let us know if you would like us to compliment your new countertop a stylish stone or tile backsplash. 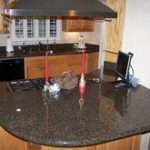 We also install bars, peninsulas, islands and other stone surfaces around your kitchen. 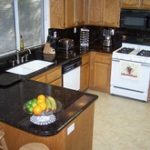 If you want to be able to prepare foods on your countertop and never have to worry about scratching it with pots or pans, Granite is the choice for you! When you call, please provide us with your stone choice and desired square footage. If your countertop is going to have a sink please be prepared to tell us whether your sink is going to be an over mount or under mount.